This is a nice story Cindy, and a beautiful sketch. Here in Provence, this moon view is called “la lune est dans l’eau” (the moon is in the water). And, while the moon croissant is horizontal we says that it is “la barque lunaire” (the moon small boat) a strange similitude with your story from the other side of our small planet. I wish you and all the ASOD sketchers a lot of artistic observations all around this year. What a nice Christmas gift for you and for us. Thank you for sharing this magic providence. 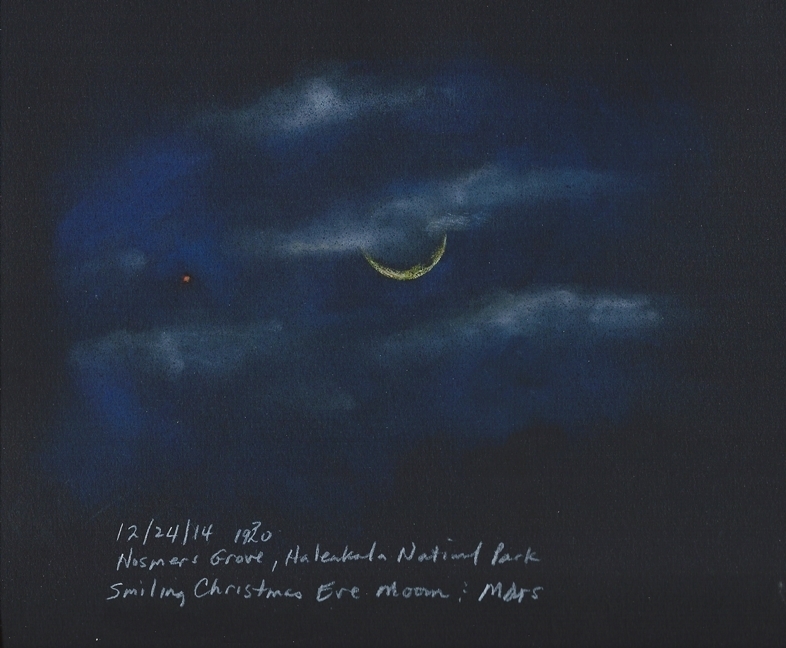 Another Stunning sketch of the Moon and Mars from your creative hand. Thank you Michel for sharing your Provence story of la lune. Such a small world it is and to hear another story associated with this phenomonon is fascinating. Thank you Jean-Marc & Frank for you kind words. Looking forward to seeing and sharing beautiful views of the heavens in 2015 with everyone here on ASOD. Warmest Aloha to webmasters Richard & Jeremy for this wonderful site. Hola, un dibujo muy bonito. Mahalo Cindy for beautiful sketches all year from your creative heart. Thank you Francisco & Maui Stargazing!